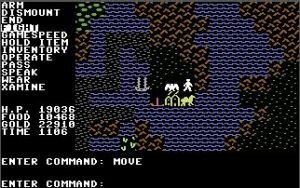 "Those of you who have played Ultima 1 will notice the similarity between Questron and that game because Strategic Simulation Inc. (SSI) secured a license from Richard Garriott which SSI then used in structuring the game world. " The game lets you know right at the start that you are a complete nobody - a Serf. 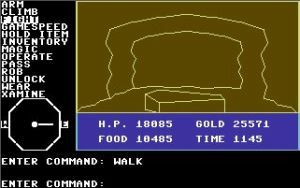 There may be a bright spot however, because it seems you are the Serf who will save the land of Questron by defeating Mantor in the Land of Evil. While the game is simple to play the simplicity of the interface belies the complexity of the story. 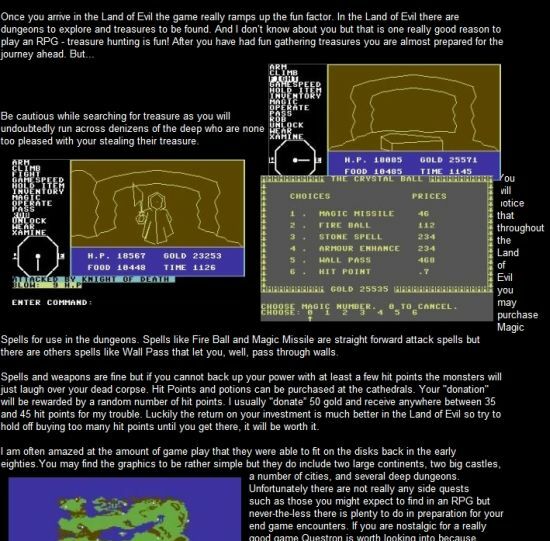 Although much of the story does not make into the actual game the game manual has a fully detailed history of Questron. I am tempted to tell you more about the story but that would spoil too many things. I guess I should explain that the story elements that appear in the manual for the game do not actually end up in the game. You are only given a cursory explanation as to how Mantron received his power. So really there is nothing to spoil, but the background story in the manual is a very interesting read. Whoever wrote the background story did a fantastic job. 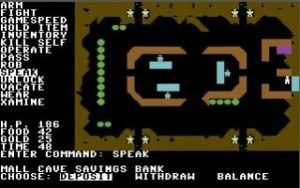 You can control your Serf with keyboard, or joystick, or by pressing the first letter of the command you wish to perform. Using most commands makes perfect sense; for example: The "Fight", "Arm" and "Wear" commands are executed by pressing “F”, “A” or “W”. Pressing “F” will cause your Serf to attack the nearest enemy. Similarly pressing “A” or “W” will show what you have in inventory for weapons and armor and you can equip [an item] by pressing the number next to the item(s) being shown. Purchasing items, food and gambling all use the same type of single letter input but additional selections are required for purchases, or when depositing funds in your bank account. The first letter of the word followed by a number to indicate which item you are interested in or the quantity you wish to purchase, gamble away foolishly, or deposit safely in the bank. Depositing some of your Gold in the bank is a good way to be sure you have some reserves in case disaster strikes. The bank is happy to hold on to your money so whenever you win a bit by gambling put a few pieces in the bank for a rainy day. Speaking of gambling there are many casino type games you can play in Questron including Blackjack, Roulette and Double or Nothing. You will not get enough gold to purchase items and hit points by fighting monsters alone so I recommend Roulette as the game of choice for winning gold. Placing a simple 12 gold bet can win 300 if you pick the right number. Be careful not to win too much at one time or the town guards will come after you, and early on you will lose that fight. Eventually though fighting the guards will not be a problem and you can place bets in the thousands, so long as your conscience allows you to kill the town guards. After you amass enough gold, hit points and purchase a good weapon or two you will be summoned before the great wizard Mesron but before you speak with Mesron it would be wise to get Knighted by the King. Mesron will acknowledge your power and explain the details of your quest. “Destroy Mantor!” First however, you must find Mantor in the Land if Evil. Although you start out as a lowly serf you can play mini games that will allow you to increase your Intelligence and Dexterity. 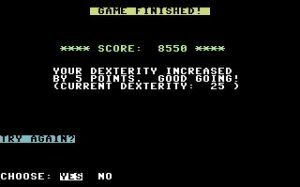 The Dexterity game challenges you to shoot targets flying from the bottom of the screen. Your score is based on how many of the targets you shoot in a round as well as the color of the target you manage to hit. I think I managed to do fairly well even though I could not find my joystick and had to use the keyboard. 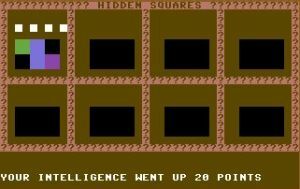 The Intelligence game is a bit more complex in that you need to guess which box has been assigned a specific color. The faster you guess correctly the greater your Intelligence increase will be. You might notice that I was really lucky and guessed correctly on the first try obtaining a very good stat increase. In addition to the stat increases you are able to get by playing the mini games the King, the Princess and Mesron will increase your stats. 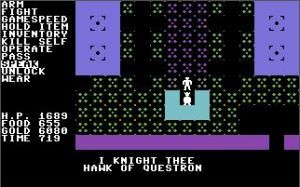 Eventually your Serf will be worthy of holding the title - Knight of Questron. Traveling around Questron and eventually to the Land of Evil will be difficult but fortunately we can purchase a multitude of transportation options. There is of course the standard Horse but you will also find more unusual forms of transportation such as a Clipper ship (yes we can actually go sailing) or the Wam Lama (which decreases the amount of food consumed when traveling). Up to this point your adventures in Questron have been pretty boring. You have been wandering around the land fighting monsters and eating an incredible amount of food. 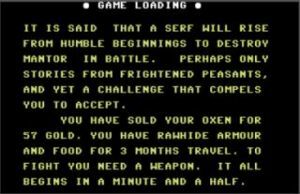 I guess Serfs need lots of food. I died once due to a lack of food so be sure to buy plenty of food. Be cautious while searching for treasure as you will undoubtedly run across denizens of the deep who are none too pleased with your stealing their treasure. 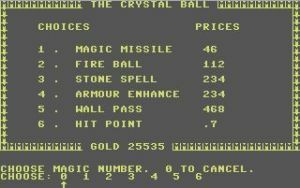 You will notice that throughout the Land of Evil you may purchase Magic Spells for use in the dungeons. Spells like Fire Ball and Magic Missile are straight forward attack spells but there are others spells like Wall Pass that let you, well, pass through walls. Spells and weapons are fine but if you cannot back up your power with at least a few hit points the monsters will just laugh over your dead corpse. Hit Points and potions can be purchased at the cathedrals. Your "donation" will be rewarded by a random number of hit points. I usually "donate” 50 gold and receive anywhere between 35 and 45 hit points for my trouble. Luckily the return on your investment is much better in the Land of Evil so try to hold off buying too many hit points until you get there, it will be worth it. 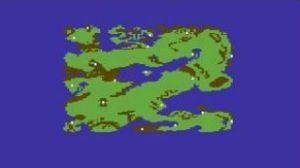 Even though Questron was based on the Ultima 1 engine SSI did not do a very good job of building the game within the engine. Your adversaries are not visible on the screen as they get close, you only get a warning that a monster approaches. The problem with that is that you have no idea from which direction the monster advances. This can be a big problem early in the game when you are low on health and probably have little or no potions. You could try running to the nearest town but you might just end up headlong into that monster. Another distraction I found was that the colors look “washed out” and by that I mean the greens are not bright and the browns are dull. 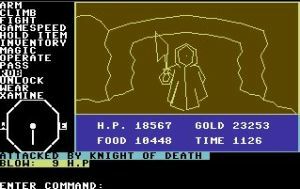 They also tried to change the color in the dungeons and while that was a good idea SSI would have been better off leaving the original black from the Ultima 1 game. Adding weapon weaknesses to the monsters was a good idea but limiting your inventory to carry those weapons was not. There will be times when you find yourself one-pointing a monster to death simply because you did not have enough inventory space to carry the weapon you needed. That may sound bad but I did enjoy the game myself because it was very well done and if played slowly and intelligently you really should have no problems advancing in the story. 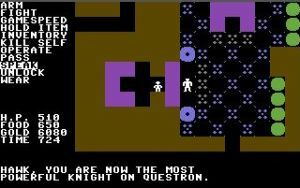 However, if you don’t care much for the RPG genre then this game is probably not for you, but if you enjoy older RPGs that were on the cutting edge I can recommend adding Questron to your collection. the game was well received and well done. It even spawned a sequel - Questron II. Now off you go to destroy Mantron and in the immortal words of Miracle Max “Have fun storming the castle”. Man's quest for enlightenment and knowledge has lead him to explore the farthest reaches of the known universe. Now one man, and his companions, will venture forth to seek the knowledge that has eluded the people of Britania for so long: The Codex of Ultimate wisdom. If you enjoyed this Questron review, you're encouraged to discuss it with the author and with other members of the site's community. If you don't already have an HonestGamers account, you can sign up for one in a snap. Thank you for reading! I've subbed this through, but please fix the screenshot issues. If not done soon, I'll have to do it myself, then I'll never let you forget how I spent my Xmas fixing your formating errors and how it ruined my entire year. That's how it displays for me. NOTE: Now I broke the previous post and can't access the edit or delete options, would someone be so kind as to mark it for me? EmP, it does not look anything like that for me. What browser are you using? I have Internet Explorer 8. Edit: Check if you are using compatibility view. Good to see you writing for the old games. I liked this review--it reminded me of how the guards would chase you if you won too much gambling. I remember problems getting started the game, but that got fixed in Q2. Things were more balanced. Have you played Legacy of the Ancients and Legend of Blacksilver? I really like both--Questron with a lot built on it. Thank you, I had fun with the game. I had not played it in years. 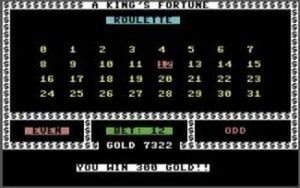 It was tough getting started - I had to reboot a lot to get some gold flowing but I found Roulette was the way to go for cash flow. Yes, I recall playing Legacy of the Ancients but not Blacksilver. I'll need to check into that one. I have started Qestron II and might get around to doing a review for that one since there is not one on the site yet. I think I still have that for my C64. If not I'll need to emulate it. None of the material contained within this site may be reproduced in any conceivable fashion without permission from the author(s) of said material. This site is not sponsored or endorsed by Nintendo, Sega, Sony, Microsoft, or any other such party. Questron is a registered trademark of its copyright holder. This site makes no claim to Questron, its characters, screenshots, artwork, music, or any intellectual property contained within. Opinions expressed on this site do not necessarily represent the opinion of site staff or sponsors. Staff and freelance reviews are typically written based on time spent with a retail review copy or review key for the game that is provided by its publisher.